Very dark with a round back. 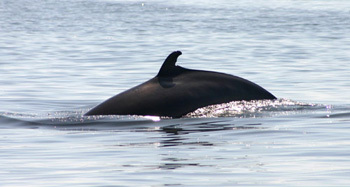 The spout and the back fin emerge at the same time when the Minke whale surface (in average, every 2 to 10 minutes). 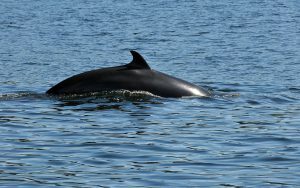 The Minke may remain underwater for 20 minutes. The spout will hardly be visible. This whale can be seen “breaching”, a word for their jumping high out of the water. The most common in the Bay of Gaspé. Can often be seen from the shore. Common near the shore from June to October.